Is value investing dead? Is this a million dollar question or just one dollar question; don’t bother answering that for it does not really matter. Whenever experts state that something is dead, hated or disliked, one has to start viewing that sector or strategy in a more favourable light. This bull market has not been kind to value investors but it has been very gracious to momentum and growth investors. We don’t think the concept of value investing is dead but one should abstain from purchasing a stock just because it offers great value. There is a reason that stock has a low P/E ratio; so one has to be careful not to fall for the value investing trap. What is a value investing trap? Buying a stock just because it appears to offer value; they are a lot of stocks trading below book value but they make for a terrible investment. However if one combines Mass psychology and technical analysis one can find great value plays that make sense. For example, the stock CALM; from July of 2016 to roughly of July of 2017, the stock was in a downtrend, but it started to bottom in July of 2017. The stock was trading in the extremely oversold ranges, it was being shunned by the public and it fell under the “value category”. If you purchased the stock anytime on or slightly after July of 2017, you would be sitting on gains in excess of 30% today. Everything depends on your angle of observance; alter the angle and the outlook is altered. Though many experts state that value investing is dead, there are just as many that state it’s not dead. The answer lies in between those two. Sadly most finance experts are on par with mules; perhaps mules are even more intelligent than these talking heads so take what they say with a huge barrel of salt and shot of tequila. It goes without saying that value investing has lost some of its fire; if you don’t use it in isolation and put the principles discussed above and below into play, it’s still a force to reckon with. Nothing stays down forever and one day value investing will make a strong come back, for now, the trend favours growth and momentum stocks. If you follow the suggestions provided above; we used CALM as an example and demonstrated how value investing can still be part of your investment strategy. 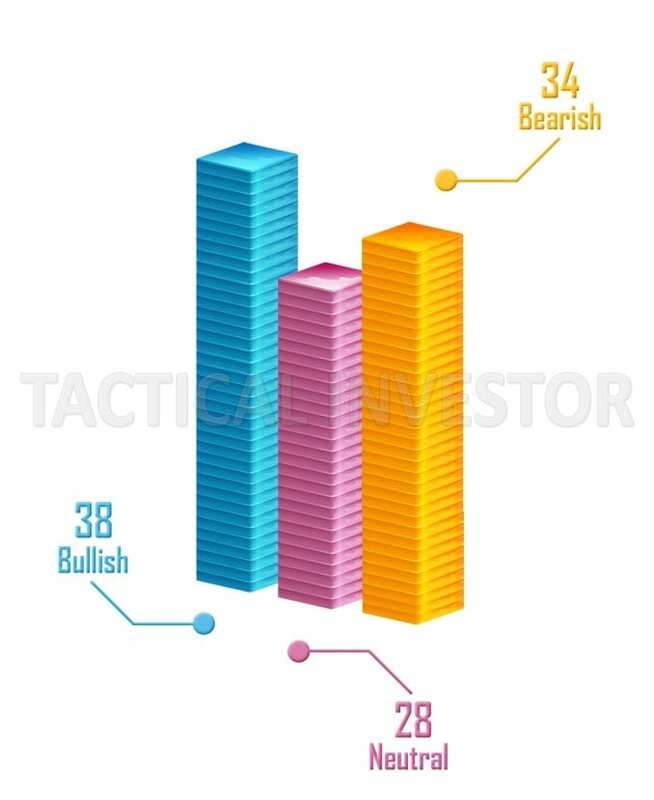 The two essential elements Mass psychology and technical analysis, it provides one with the tools that will help you determine if that so-called value stock is worth getting into. The small surge in bullishness appears to be short-lived, what remains constant is the number of individuals in the Neutral camp. Until the individuals in the bullish camp surge past 70% for several weeks in a row, the markets are unlikely to put in a long-term top. Corrections ranging from mild to strong is all most investors will have to worry about. Most of the pullbacks will be in the mild to medium ranges with the occasional pullback falling into the “strong” category. At this point, the odds that the SPX will trade to and past 3000 are now close to 70%. Despite being extremely overbought, the trend for the major indices of the world (Germany, US, Australia, Britain, etc.) is up. The Australian markets are still extremely overbought both on the weekly and monthly charts, so at the least investors should wait till our indicators on the weekly charts pullback to the oversold ranges. 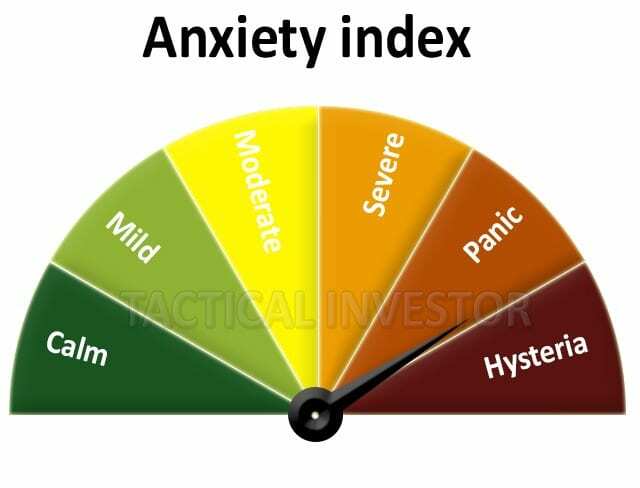 This market is in sore need of one strong pullback, but this market is irrational one cannot expect the market to pullback just because it’s trading in the extremely overbought ranges. Therefore our gameplan is to continue opening long positions in stocks that are extremely oversold on the monthly charts. This plan will remain in force until 1-2 of the major indices like the Dow, SPX or Nasdaq experience a bearish signal on the monthly charts. Though the Dow and the SPX are trading in the overbought ranges, on the weekly charts the Dow, as shown above, is gearing up to trend higher. The MACD’s have experienced a bullish crossover right at the halfway point (minimal oversold zone). 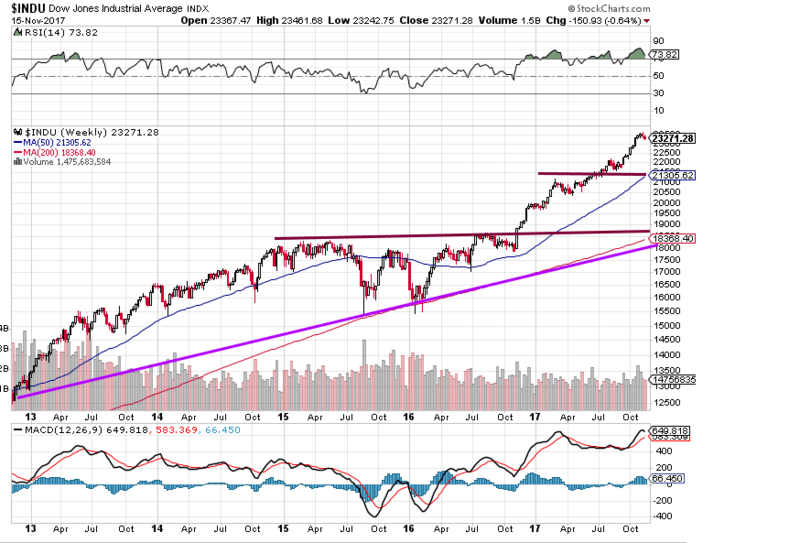 We would not be surprised if the Dow traded to the 23650-23800 ranges in the near future. Risk takers can use pullbacks ranging from 350-450 points to open long positions. The Dow does not need to pull back 350-450 points in one day. For example, it is currently trading slightly above 23400. Risk takers could open long positions from 22950 to the 23050 ranges. So to answer the question Is value investing dead? The answer would depend on your perspective but an astute investor would state that from a long-term basis an investment strategy is always alive. Value investing has taken a back seat due to the huge amount of hot money that has flowed into this market, but it will make a comeback. Until then, you can still find value plays that have great potential by combing mass psychology with technical analysis. Value investing is not dead, and for me, there remains a wealth of opportunities out there if you do your homework. Importantly, I continue to consider a longer-term view than the market, searching for attractive entry points by looking through what we view as shorter-term, cyclical pressures. The U.S. stock market is showing the biggest divergence between cheap and pricey stocks since the aftermath of the dot-com bubble, as investors chase the performance of companies with rising earnings. Valuation of growth companies-those able to show rising earnings, typically priced at a premium-have soared this year even as price/earnings ratios of cheap, so-called “value” stocks slid, an unusual separation. “The market remains very challenging for value investing strategies, as growth stocks have continued to outperform value stocks. The persistence of this dynamic leads to questions regarding whether value investing is a viable strategy,” Einhorn wrote in an investor letter Tuesday obtained by CNBC. “Our view is that just because Amazon can disrupt somebody else’s profit stream, it doesn’t mean that Amazon earns that profit stream. For the moment, the market doesn’t agree,” he wrote. Value Walk on the question; Is value investing dead? However, value investing is not without its flaws, as well. The problem with value investing lies in what it’s typically based on–rumours, hearsay and superficial analysis. Value investors believe the market overreacts to good and bad news, resulting in sharp stock price movements that don’t actually correspond with a company’s intrinsic value and long-term chances of success. Thus, giving investors an opportunity to make a profit while the price is deflated. What’s more, value investing is highly subjective. 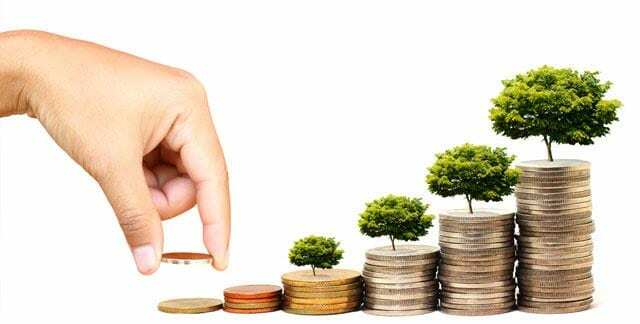 Some investors only take present assets and earnings into consideration and do not place any value on future growth. While other investors base their entire strategies only on the estimation of future growth and cash flows. The Goldman Sach’s June 2017 report titled, “The death of value?”, recently dubbed the strategy as fading in effectiveness. They’ve even gone as far as proclaiming that implementing the value investing approach has resulted in investors in a cumulative loss of 15 per cent over the past decade. Even the legendary value investor Jeremy Grantham voiced his concerns with value investing in his first quarter letter to investors for 2017. He stated, “this time seems very, very different”, and finally succumbed to the idea that the rules of value investing may no longer apply. His reasoning? Similar to many investors, he claimed both corporate profit margins and consequently, valuations are permanently higher and that his patience has dwindled in waiting for the divergence to resolve. If you look at this chart it seems to indicate value investing is dead? 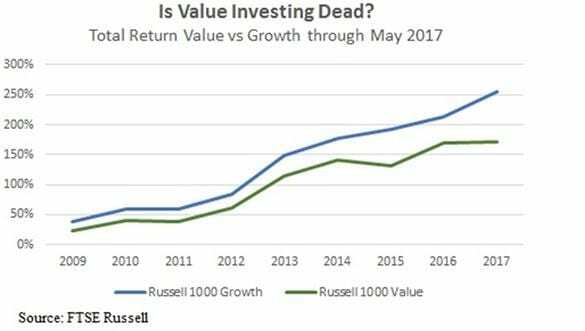 The Russell 1000 growth has handily outperformed the Russell 1000 value. Remember everything you see has to be taken with a grain of salt. If you apply the concepts we discuss below, then you would not buy a stock just because it falls under the “value” category, but you would look at other mitigating factors too. Most value stocks are not soaring upwards because they have very little to offer; the market is a forward-looking beast and so it has priced the growth potential of that stock. Don’t buy a stock just because its P/E ratio is low. Focus on other factors such as quarterly earnings and revenue growth rates, insider ownership and the technical’s of the stock. Don’t make the same mistake. All strategies underperform from time to time, but eventually, they recover. This has happened before to value investing, and it will happen again. If you go back to the period of 1997-2000, you can see that growth outperformed value massively. The market was crazy for everything that looked internet-ish. Warren Buffett was ridiculed during the dot-com bubble, but he didn’t let that affect his investment strategy — and he got his revenge when the market crashed by realizing hefty profits. There is so much noise and speculation out there in the media and social media today. You need to learn to ignore it. Various strategies are promoted with promises to outperform massively, but the truth is that few investment strategies have been backtested so thoroughly and extensively as value investing. The result is clear — value investing does outperform in the long run. Tune out the noise and focus on true value. It really doesn’t matter if you implement a low P/B, low PE or negative EV model — it will all work out because buying a stock for less than what it is worth is the best strategy.